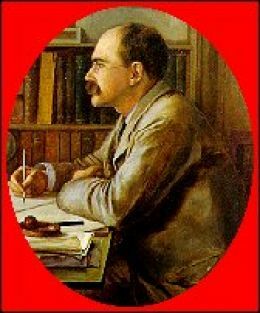 Some years ago I wrote an article about Kipling for the Reputations section of the Salisbury Review but, at the moment, I cannot find it either on the internet or in hard copy, which I do have. As soon as I do so, I shall either link to it or quote from it. I do recall that I referred both to Orwell's and T. S. Eliot's essay on the man and his work. They are both interesting in that they were written at a time when Kipling was seen as something of an embarrassment to the literary establishment and the two critics, approaching the subject from different political perspectives, came to similar conclusions: a very good poet, often a good prose writer, difficult to accept politically but not quite as bad as people make him out. Times have changed and our attitude to Kipling (give or take idiot students in Oxford, I imagine) has also changed. We still think of hims as a good and accessible poet. If was voted as the nation's favourite poem and I am not surprised. Recessional is not seen as a glorification of imperialism and racism, as it was for many years, by anyone who has actually read it but as a warning against hubris and arrogance. His later poems about the First World War are full of woe, not least because he lost his only son in it and felt guilty about pushing him towards enlistment, despite him being too young. His children's books are a delight and his Indian stories continue to be popular. He was one of the few authors who understood children and could write about them as well as for them without making one cringe with embarrassment. He also understood and could write about people usually dismissed by the literary establishment, such as ordinary soldiers, the people of India who are between castes and races as well as the lower ranks of the Indian Service. There are so many things to say about this man who is still underestimated by many but let me just add one highly admirable characteristic: he consistently refused state honours even when George V personally offered him a knighthood. He even declined the Poet Laureateship. A writer and a poet, he thought, should not be accepting such honours. He did accept honorary degrees and, eventually, the Nobel Prize for Literature. How many literary personalities who pretend to be far more radical jump at the chance of a gong, a handle or the ermine? Meanwhile, here are some links to discussions about Kipling: an OUP blog about what he really wrote about the First World War, an interesting piece about Kipling's birthday being celebrated in India and an excellent piece by Christopher Howse in the Telegraph about Kipling "the misfit poet". He was quite a varied writer. His output includes a couple of excellent science fiction stories (WITH THE NIGHT MAIL is actually a very important story in the history of the science fiction genre). KIM is certainly a masterpiece. Anyone who dismisses Kipling as an unthinking imperialist hasn't read KIM. He was an imperialist, but an intelligent, complex and thoughtful one.